Tara Whittaker Photography will be supporting earthquake relief efforts during the month of February. I am offering mini-engagement sessions for $300 (plus gst) which include 30 minutes of shooting within the Calgary area and 20 High Resolution Images on a CD. For each mini-engagement session booked during the month of February, $150 will be donated to Help Haiti through Samaritan’s Purse. Give us a call to book your shoot at 403-247-3746. If you’re interested in making a donation of your own, click here. I have the privilege of being the resident photographer for Fire Exit Theatre here in Calgary and this week their second play of the season, Second Bloom, opened. If you have a chance to catch their final performances on Saturday the 16th, I highly recommend it. They have 2:00 pm and 7:30 pm performances tomorrow in the Engineered Air Theatre at the Epcor Centre for the Performing Arts. Check it out. If you’re newly engaged and are looking for wedding inspiration, check out Bridal Fantasy at the Telus Convention Centre on January 17th, 2010. Be sure to stop by my booth and say hello. I look forward to meeting you. Sometimes a “day-after” wedding shoot is the way to go. You’re relaxed, happy and the pressure of the actual wedding day is off. It’s brilliant. Such was the case for Blake and Julianna. 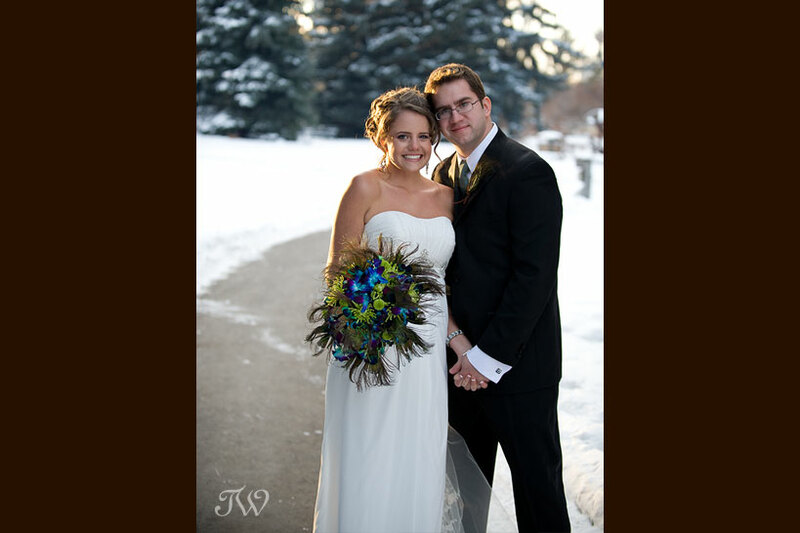 I shot their winter wedding photos on a coooold day in December. 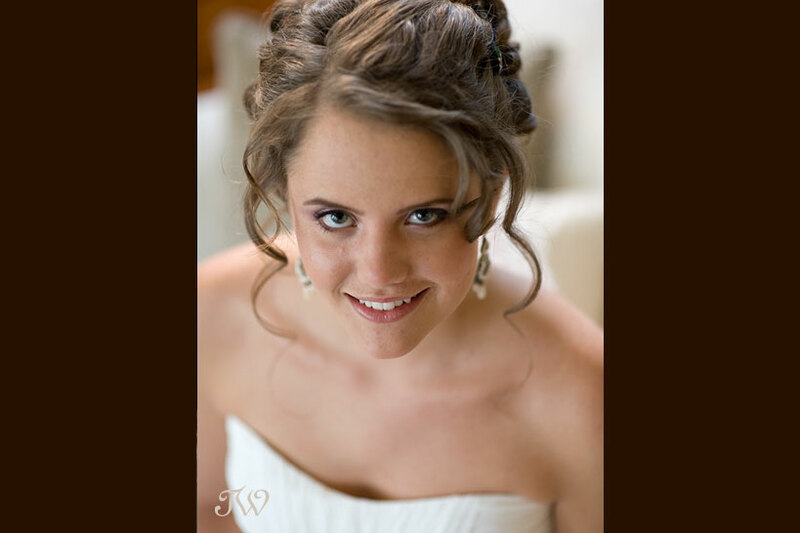 We started out in Okotoks where Julianna had her hair and make-up done by Shea Brown at Hue Hair Salon. The inspiration for elements of this winter wedding came from Snippet & Ink. Kathryn’s amazing blog is a feast for the eyes. If you’re looking for inspiration for your own wedding, check it out. Many thanks to the lovely ladies at Evelyn’s Memory Lane Diner in High River. We ducked into the cafe to warm up and have hot chocolate. I couldn’t help but take a few shots against the classic diner backdrop. Next thing we knew, they had fired up the jukebox and the sound of George Strait’s “Carrying Your Love with Me” filled the diner (it is Alberta after all). Here are a few shots of Blake & Julianna dancing in the diner. It was the perfect ending to a perfect day. To ring in the new year, I shot my first wedding of 2010 on January 2nd. Pam and Gord tied the knot on a beautiful but wintery day, in the Safari Lodge at the Calgary Zoo. Their wedding was filled with personal Latin touches, in appreciation of Pam’s Mexican heritage. Be sure to check back in the the coming weeks for the full story. Don’t miss it! If you follow my blog, you may remember Pam & Gord’s engagement session back in November. Happy New Year to all. I’ll leave you with a few shots of my niece and nephews taken on Boxing Day.